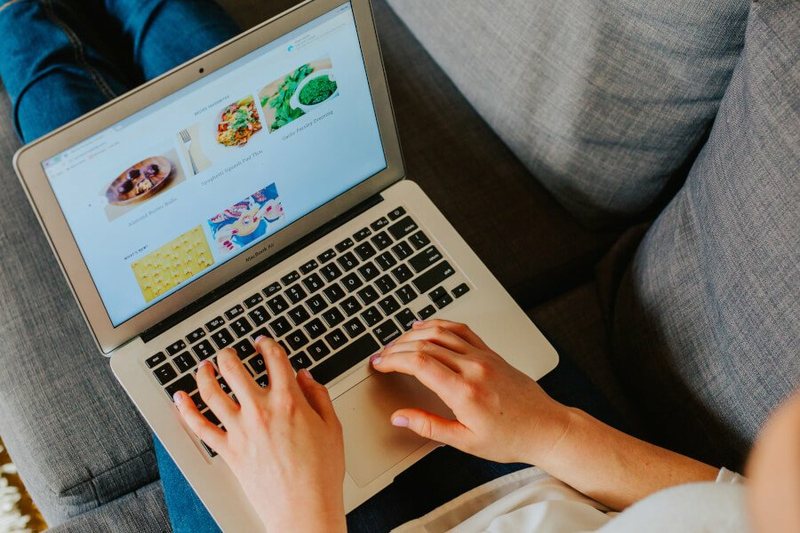 When I shared my initial thoughts about Canada's new food guide on Instagram, I intentionally approached it from the perspective of where it's at today, based on current research and my expertise as a Holistic Nutritionist – not based on what it was. The general consensus and most common comment I heard was "it's better than what it was – we are moving in the right direction!". While this may be true, I was more interested in evaluating it for what it is today, in 2019, versus what it evolved from over 10 years ago. While I wholeheartedly agree that progress has been made, especially because of the inclusion of healthy eating beyond the food you eat and the removal of dairy as a food group, I believe we still need a critical review of the 2019 Canada Food Guide. After all, this is the guide that will be used as gospel for schools, hospitals (maybe it will inspire them to remove jello from the menu? ), nursing homes, prisons and more. Before I get to my review, if you don't want to read all the way to the bottom and you just want to know if you should follow this guide to a "T", my short answer is no. You can use it as a guide, to which you adapt and customize it to your needs and your family's needs, but no guide can be suited to 37 million Canadians – and that's just the reality. This is the reason I've never recommended any client or reader of my blog to follow any governmental food guide. In fact, where I went to school, we weren't even taught to follow a guide such as this. That is also one of the reasons I chose to study Holistic Nutrition which is evidence-based nutrition with a strong focus on prevention that is not guided by a government that updates its food guide only a handful of times over a 75 year span. I've taken a lot of time to go through the updates to Health Canada's website and reviewed almost everything. If I have missed something important, please feel free to comment below and I will do my best to keep this post updated. We can all benefit from eating more plants! There are nearly 25,000 known phytonutrients (naturally occuring beneficial compounds in plants) that can help us fight disease and truly thrive so it's an absolute necessity that we eat more plants. 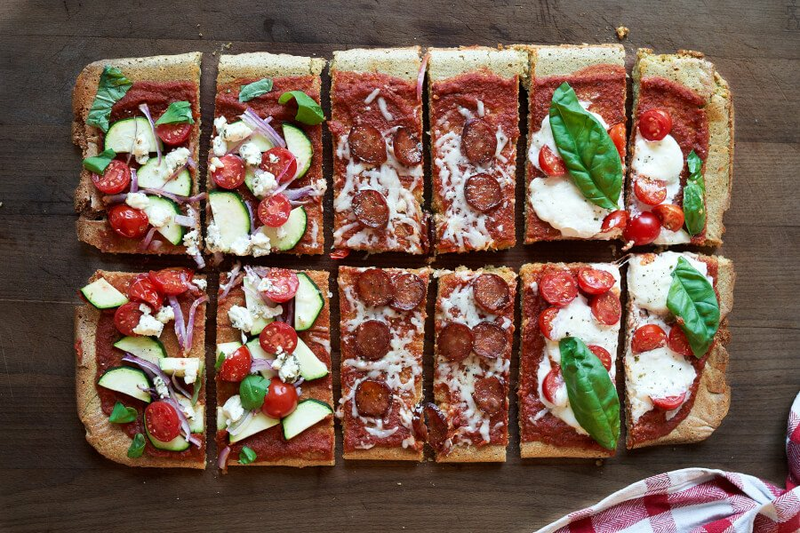 This is why most of my recipes on the blog are plant-based and every day of the week, the large percentage of what I eat and my family eats is plants but we still eat fish, chicken, some dairy, occassionally meat and my hubs and daughter would be more than happy to eat their weight in pizza and pasta. We eat also eat a healthy dose of fat with every meal and snack. I've been advising my clients and community alike to fill at least 50% of their plate with plant-based foods since I became a nutritionist nearly 10 years ago, as have most of my colleagues. 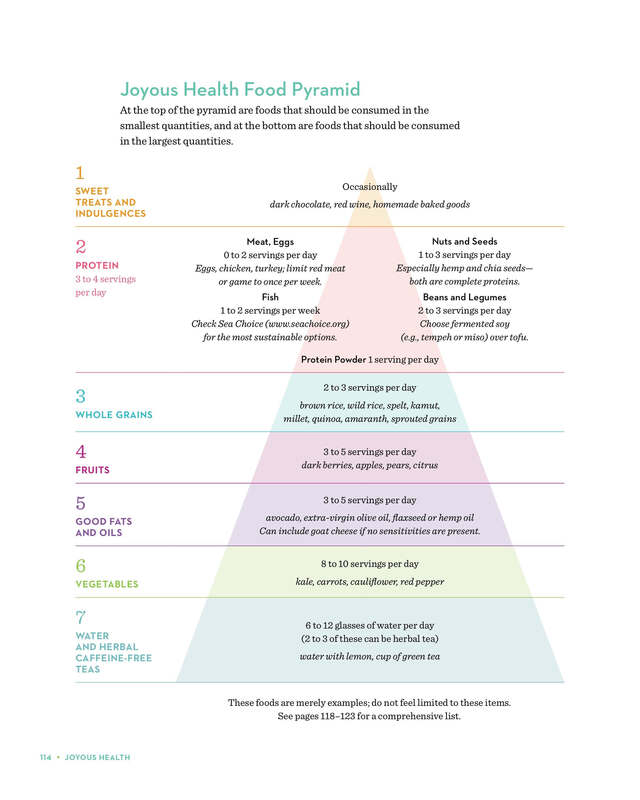 In fact, in my first cookbook, Joyous Health, I created my very own food guide pyramid as you can see below. It was 5 years ago that I created this so the main tweak I would make is to ignore the serving number and just follow this as a general guideline. At every meal and snack, make sure you have protein, complex carbs (preferably from veggies) and some good fat. As for the grains section, please see my note at the very bottom regarding grains. But back to Canada's food guide – way to go Health Canada, let's eat more plants! At a quick glance, it looks pretty good and much more enticing than what it was before. Real food does look far more appetizing than illustrated pictures, which is what most other food guides worldwide do, including Canada's food guide in the past. Many people have since commented that it looks very "diet-like" and quite unappetizing. Personally, I don't mind it. To me it looks like a flat-lay on instagram :). It's absolutely fantastic that this is front and centre. Water is definitely the best drink of choice for hydration and something we should be drinking multiple times per day. It's great they advised how to make your water more tasty by adding fruit ( hello lemon and water! ), spices ( cinnamon ) and herbs (like basil!). 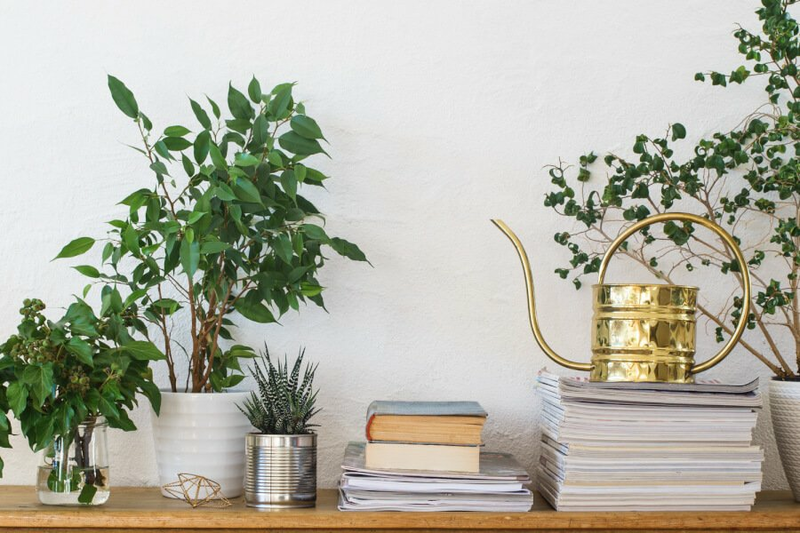 I think it's awesome there's an extensive section on mindful eating which includes how to create a healthy eating environment, cooking more often, eating meals with others, listening to music while eating, socializing over food, and more. Beyond this page and image you see here, I really wish they would have made this section a little more visually appealing. It's like dry toast trying to get through it (like reading a Microsoft Word '97 document, to be exact - haha!). I'm assuming this is based on budgetary reasons but a stock photo that costs 10 dollars would make a world of a difference! I'm really glad Health Canada went more in-depth on educating the public of food marketing. It would have been great if they used visuals and specific examples to illustrate this. 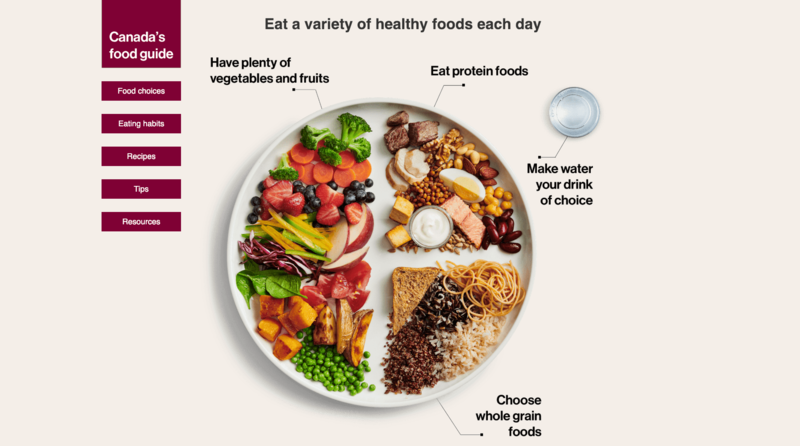 Here's the flipside to my point about giving Health Canada a high-five on recommending people to fill half their plate with plant-foods. Because if we go a little deeper into their recommendations, you find that fresh food is on par with frozen and canned foods. In fact, they state "fresh, frozen or canned vegetables and fruits can all be healthy options". This is really bad advice. The bad advice is providing no distinction between fresh, frozen or canned. If you follow their recommendation, you might as well "skip the hassle of fresh foods" (but really, they are no hassle) and just eat canned foods all day (but actually, don't do that, for the sake of your taste buds and health!). Fresh can definitely be on par with frozen. In fact, sometimes frozen can be even more nutrient-dense than fresh food that was picked a month ago and travelled 950 miles to get to the grocery store shelf. Strawberries picked in July that were flash frozen will be FAR more nutrient dense in January than fresh strawberries flown in from New Zealand. Joyous Tip: Buying frozen organic produce in the off-season can often be more affordable than conventional fresh. So you can both save a few bucks AND get more nutritious frozen foods. Of course, when produce is in season, it will be the most nutrient dense AND more afforable option. There were a few people who were upset with me on Instagram because I said that canned foods were a poor recommendation. They were upset because they felt I was out of touch and an "elitist" and that by stating that canned foods were a poor recommendation, I was not considering people who are on a limited budget or of lesser means. If Health Canada is so inclusive and hyper-aware then why the heck are they recommending "Pre-bagged vegetables that can be quickly tossed into a salad. Try: baby carrots!". I don't know about you, but I NEVER buy baby carrots. One because of the outrageous price tag and two because they are very wasteful (they use large carrots to make baby carrots) but that's besides the point. My review of the guide was not from a socioeconmic perspective; it was purely from a health perspective. I would be doing a disservice to my community if I, too, said, fresh, frozen and canned foods are all created equal. Canned mushrooms that can sit on the store shelf for 8 years is definitely not your best choice, especially when you have a choice. Don't ALL people, exclusive of how much money they make, deserve to know what the healthiest choices are? UMMMM – DRINK WHAT, NOW? Water is good. Okay, agreed! But vegetable juice is ... not? Same goes for fruit juice, but for some reason, it is no where to be found under the "what to limit section". This recommendation really perplexed me. Under "Make water your drink of choice" it listed "vegetable juices" under the "what to limit" section with no mention of fruit juice. Sure, it does say limit sugary drinks but knowing how terrible fruit juice, pop and other sugary drinks are for our health, I can't for the life of me understand why this wasn't included. And again, there is no distinction between a healthy, cold-pressed homemade veggie juice or a canned store-bought choice. Simply saying that "vegetable juices" should be limited would put my delicious and nourishing green juice in the bad category. If I didn't know anything about nutrition, I would think that my green juice is no good. I can only guess their recommendation to avoid veggie juice is based on the highly processed vegetable juices like V8 that are full of sodium. But who knows!?! Whether they realize it or not, the large majority of people (up to 60%) cannot digest lactose, the main sugar in milk, and many of the remaining are either allergic or intolerant. The form of dairy that most people are consuming is pasteurized and homogenized cow's milk which is a pro-inflammatory food with many problems. This shouldn't be anywhere in the guide in my opinion. The focus on low-fat dairy is a great way to completely eliminate any benefits of milk like fat-soluble vitamins A, D, E and K which actually require fat to be absorbed. The best option for hydration is and always will be – water. And if you're so inclined to drink milk, don't go with skim. Go with full fat and you'll drink less of it because you'll be consuming a more filling and nutritious drink. 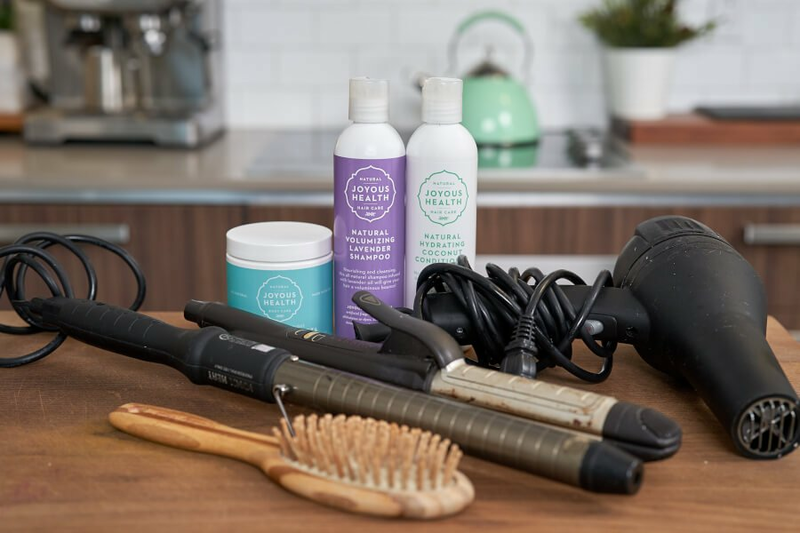 Soy is one of the most common food sensitivities, allergens and for many suffering from hormonal imbalance, soy beverages can exacerbate these issues. Research has already shown it can reduce fertility in men because isoflavones in soy are plant compounds with estrogen-like effects. I've seen the negative implications of consuming soy products in my own clinical practice and I experienced it myself. You can read about it in this post about food is fermented. Fermented soy products include tempeh, miso and natto. If you want to avoid GMO foods, make sure you purchase certified organic soy products only. This is such a big miss! Fat is one of three macronutrients that we need for survival. In fact, there are fats that are essential and we MUST get them from our diet because our body cannot make them. If I was on the committee creating this, there would most definitely be a designated section on the plate for healthy fats. If you want to learn more about the types of fat I recommend, you can check out this video and blog post. 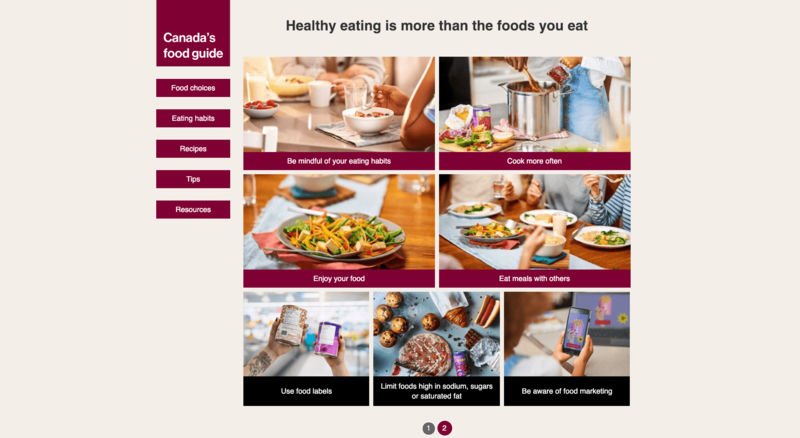 If you dig deeper into the various links on Health Canada's website you'll come across advice on fats and recommendations for cooking with corn and canola oil (nooooo!). Not to mention, many of the recipes include margarine as an ingredient! 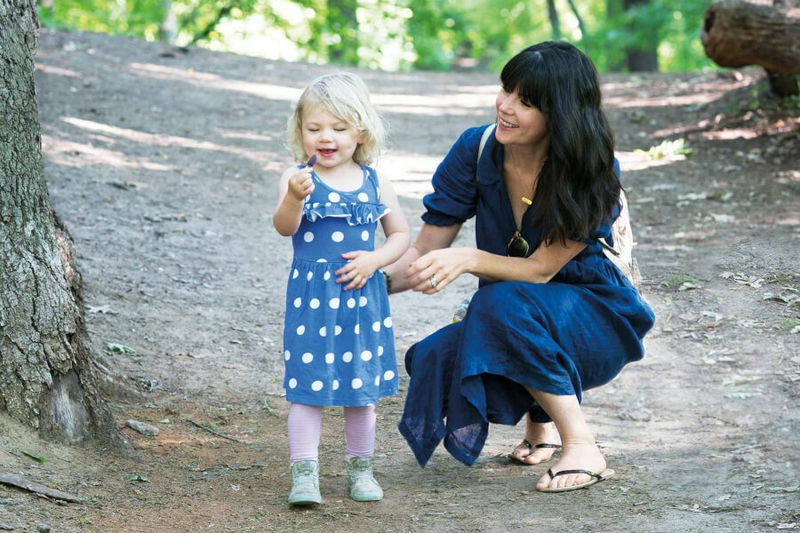 Wellness Mama recently did a great job of explaining the harmful effect of canola oil which you can read here because it really deserves a whole blog post. Just like soy, canola and corn are commonly genetically modified foods. This is probably the biggest misinformation of the entire food guide. Health Canada is completely ignoring the latest science (read 5 studies here that debunk the myth that saturated fat causes heart disease or raises cholesterol). Their opinion, that it should be avoided (which is what it is – an "opinion") is not based on scientific evidence and this opinion is included on nearly every page. When the recommendations were given to avoid saturated fat, heart disease rates skyrocketed, as did the consumption of carbs and liquid vegetable oils like canola, sunflower etc. "Despite popular belief among doctors and the public, the conceptual model of dietary saturated fat clogging a pipe is just plain wrong. A landmark systematic review and meta-analysis of observational studies showed no association between saturated fat consumption and (1) all-cause mortality, (2) coronary heart disease (CHD), (3) CHD mortality, (4) ischaemic stroke or (5) type 2 diabetes in healthy adults." "Similarly in the secondary prevention of CHD there is no benefit from reduced fat, including saturated fat, on myocardial infarction, cardiovascular or all-cause mortality." Every single food on the planet that contains fat, includes some amount of saturated fat, so you actually can't avoid it! Your body needs fat for survival, and that includes saturated fat. Recommending low fat and the avoidance of saturated fat is just plain wrong and dangerous. I could go on and on talking about the Diet-Heart Myth but I've included lots of links to studies for you to review on your own because I need to move on to my final point. So ditch the white egg omelettes (eat the yolk - these guacamole eggs are divine! ), don't bother with low fat dairy and start eating high-quality healthy fats again. You'll be more satiated, you'll feel and look better and will even give your brain a little boost! Even if you're vegan, you can get a healthy dose of saturated fat from coconut oil and coconut products. Okay now I almost feel bad saying this, but I have no idea who developed these recipes for Health Canada but they are pretty awful. Ingredients such as margarine, canola oil, corn oil, skim milk, all-purpose white flour are scattered throughout the recipes. 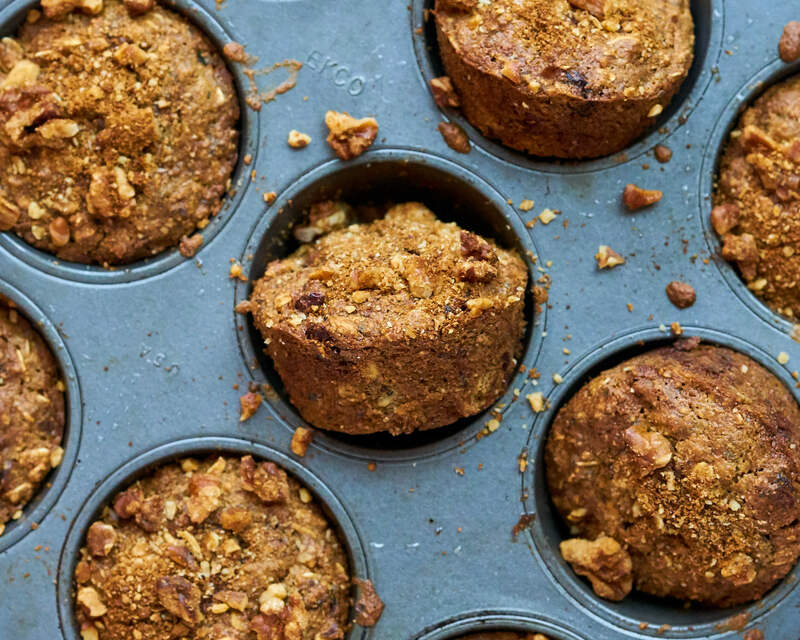 I mean, just check out these muffins? 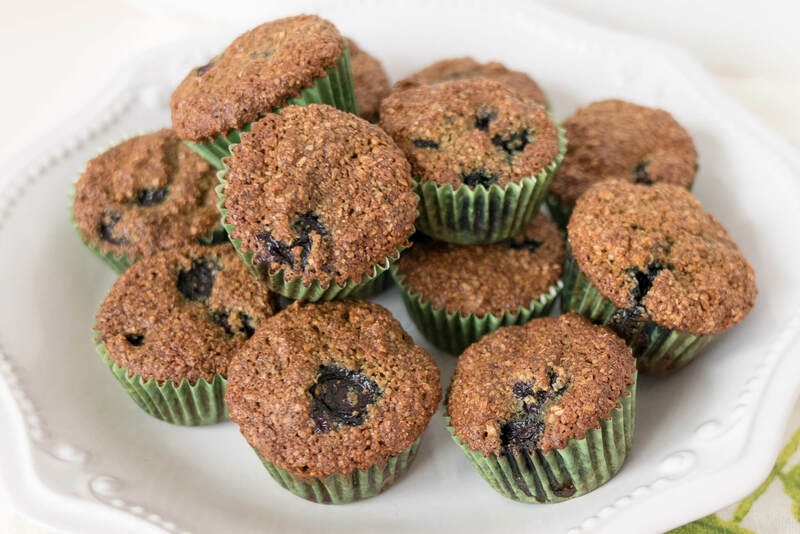 I don't even know where to start so rather than beat up on the recipes, I will share some healthier mufin recipes that are nourishing and absolutely delicious! As with any food guide, if you have food restrictions or health concerns that require a specific diet, it's best to speak with a qualified health care practitioner because even my food pyramid requires tweaking if you follow a grain-free diet due to an autoimmune disease. Looking forward to chatting with you more about this! Thank you! A little too much praise going on for the new guide and I whole-heartedly agree with every word you said, in particular the fats of course. I thought we were over the hate on saturated fats... I also have so many concerns about soy and grains, and dairy... thanks for giving a well thought out post on this, I've been bothered by the praise for "progress" because it is still spreading misinformation and flat out dangerous information for the health of Canadians. I agree. Many have been praising the guide as so much better than it was. While I agree it's good to be positive and I too, am a very optimistic person it just really sends the wrong message. There are definitely some good steps forward in the right direction but it's still not something I would ever recommend. I like your point about grains and there is definitely too much emphasis as many people improperly prepare grains and have trouble digesting them. Thank you so much for your analysis on this. I wish you were part of the team revising the Food Guide. Loved your review! Thanks for adding all the links too! I am also following the Joy McArthy diet plan. I’ve tried a lot of your recipes and am the proud owner of your 2 cookbooks... when is the 3rd one coming out? Thanks Anne! I'm so happy you've been enjoying my recipes and cookbooks and that you appreciated my review. I’ve read so many mixed things about soy. Originally I thought it was bad and avoided it - my lattes suffered - so I read more and learned the soy raised for animals is very different than that grown for people and that it actually isn’t bad. Erin Ireland shared that soy is the closest to breast milk so I’m wondering how it could be bad? Please share more of what you know! It's very controversial because the studies are quite mixed. The best thing t yo do is to take a break from it if you do drink it daily (at least 2 weeks) and observe how you feel (digestion/energy etc). If you are going to consume soy products, as I mentioned in my post it's best to consume fermented and/or sprouted soy products. Soy being the closest thing to breast milk is really NOT wise advice and completely untrue. In fact, it's dangerous that someone is even recommending that. Great post! Love the breakdown. I also get a little frustrated when I hear the "elitist" excuse to a more wholesome diet. I wish we would stop making excuses for filling our bodies with junk just because they are the less expensive option. It's about quality over quantity and what our bodies can actually get out of it and thrive, not just survive! Glad you enjoyed my post! Thank you for your comment Ludivine! Baby carrots washed in chlorine?!?!?!?! Can you please fill me in on this? I never bought baby carrots as I assumed they were likely GMO, but then I found organic baby carrots. If they are organic, that means they are not GMO, right? But washed in chlorine??? I'm quite disturbed by this and even more disturbed by the fact I give them to my children, who eat them daily. Well some companies claim they wash any excess chlorine off baby carrots but when I've been at a party or had a baby carrot elsewhere, it still tastes like chlorine to me. That being said, many precut prewashed food items are washed in chlorine to prevent food poisoning. Baby carrots are also extremely wasteful because they are formed into baby carrots and not actually grown that size. However, if you can't taste the chlorine on them perhaps the organic carrots are different! Wow, I had no idea. While I can't say I've noticed a chlorine taste (like I have in my tap water on occasion), and maybe organic baby carrots are different, I'm not sure I want to take that chance without knowing for certain. Looks like I'll be chopping up carrots tonight for my children rather than giving them baby carrots. Thank you for enlightening me! Honestly, I wouldn't stress about it. The good news is you're giving your children vegetables. Way to go mama! But you'll save a few bucks if you just chop large carrots. Thank for your thoughts. Baby carrots are very wasteful and expensive. So for the average person trying to make healthy choices, full carrots are definitely the way to go! Thanks for the overview. Always appreciate your perspective and knowledge. Can you share some of your protein ideas that aren’t meat or fish (you mention eating protein at every meal)? Also - I have heard the same thing about chlorine and baby carrots. For sure, here's an older post/video I did on plant-based sources of protein: https://www.joyoushealth.com/27068-blog-8-sources-of-plant-based-protein Enjoy! Thanks for the post, Joy! When I taught my students in Health class I always told them I thought the Food Guide was flawed and that veggies and fruit should be the majority of your diet. I’m happy to finally see some changes. I always brought in fruit and veggies for them to try. The lunches that I see sometimes make me sad, with highly processed foods making up the majority. It is actually more expensive to purchase these than including fresh fruits and veggies! There’s still some work to do. That's great you took it upon yourself to educate your students, way to go Fran! It would be great if the government actually collaborated with people who know what they are talking about. I would also add that the government will never revise to the extent you would like to see, because they'll get a backlash from many of the businesses who provide us with these food choices. Part of it is likely $$$ and politics. Sad, but true. Agreed. Sadly I believe there will always be food politics even if Health Canada claims there was no industry influence. If that's the case then why is dairy still even on the food guide. It's cheaper to get calcium from non-dairy sources. This is why I don't follow the Canada Food Guide for my family and likely never will. That's a great point, I will add it to my article. Thanks Virginie! Thanks Joy! I totally agree with you on ALL points! Just scratching my head and thinking...Why couldn’t Health Canada get this right??? As an elementary teacher I will struggle with this document, given that I don’t whole heartedly accept it. The Canada Food Guide is currently part of the Health curriculum for Grade 2. My pleasure. Thanks for commenting. Are you allowed to adapt it at all for the students? Yes, we can offer our own perspective. In Grade 3 we talk about food intolerances and allergies so of course at that point we can hopefully get through to the students that this is just a “guide” and that everyone’s body is different! Couldn’t agree more with your thoughts! I was surprised to see they hadn’t included healthy fats on the plate. And I truly hope it does influence the menus in hospitals. I was shocked at the food selection when I gave birth a few months ago. Jello, only canned veggies and fruits, and dry beef- for people who are trying to heal! Needless to say I had my husband bring me all of my meals from home. That's great you have a caring husband who could bring you nutritious food to eat in the hospital. It's very sad that an institution where people are supposed to get well feeds people the poorest nutrition. It's soooooo backwards. It is VERY sadly ironic what hospitals serve inpatients and what is available in their food courts for outpatients. Food that contributes to making or keeping people sick. When my husband was diagnosed with brain cancer, I went to the cancer clinics nutition department. The place was stocked full with Ensure drinks. That was all that they recommended. Nothing else. Awful. When patients came out radiation or chemo sessions, they were offered candy and chocolates - like some big treat. The gesture was lovely but the food was exactly what the body does not need. Hospital nutrition in this country needs a radical and complete transformation! I agree 100%. It is absolutely atrocious what patients in hospitals are fed. I was visiting a Diabetic client a few years ago in the hospital who was literally being fed jello. I asked the nurse about it and she said that must have been a mistake, "but oh well, enjoy it"! Yikes! Thanks for the idea. I've actually never had that request come to me before. I imagine if there were enough francophones then it would be a good idea. I write all this content for free so I would have to evaluate if I can afford to do that for my articles. Thank you for the idea though! With regards to fresh vs frozen vs canned vegetables... having grown up in a remote northern community that didn't have access to fresh (let alone organic) vegetables, canned and frozen was the only way to go. My sister now provides counsel to parents with very low income in a remote community, and advises them to eat vegetables with every meal. Canned (sometimes frozen) is often their only option. The food guide has to serve all communities and levels of income and sometimes only frozen or canned is all that's available. Frozen is a great option and in some instances will be more nutritious than fresh! I realize that the food guide has to serve all communities but I actually don't think they did a very good job of that when you consider some of the recommendations given. However, I wasn't reviewing it from that perspective, I was reviewing it from the perspective of a health practitioner as I believe everyone has the right to know what is the healthiest option and then they can make the best choices that are available to them. Thank you for taking the time to read Denise! No I didn't mean it that way. I'm not anti-dietician. My comment was a general statement that we are not regulated to follow Canada's food guide how many industries are ie. school boards etc. I heartily agree with this article Joy! The new guide definitely has some good things moving in the right direction but there are other things, as you identified, that they completely missed the mark. I LOVE YOU!!! YES YES YES! When I worked for our university health center as a health educator, the nutritionists were still telling people to buy the low fat boxed foods. It took them a couple years to get with it. Your evaluation and diplomatic honesty is a life saver!!! Thank you for saying it. Thank you for your well thought out post. I am pleased to see the direction the Canadian Food Guide is going, in saying that there are still big pieces that need to change. We have such a big education piece that we can share and this is only the beginning. It has been so good to see so much conversation around the new food guide. Great post! I agree, it is great there has been a lot of conversations around the new food guide. Thanks for taking the time to stop by! You are hilarious and informative. Love you Joy. Awesome advice. Can you make a new recipe for healthy apple pie pastry. I bet you will use coconut oil or mana. Which one would be best? Excellent Joy! So glad you debunked a lot of the misinformed "nutritional" guidelines. And those muffins...lol. I cringed when I originally saw the recipe! Thanks for writing this. I'm sharing. I hope it gets shared everywhere! I do like that they recommend being mindful of emotions and thoughts when we eat. Emotional eating is something most people go through these days. I appreciated this very detailed review of the New Canadian Food Guide. I have not had time to read it in its entirety so this article is a great summary. I agree that while the new Food Guide has made positive steps, there are still improvements to be made but hey, Rome was not built in a day. Cheers. That was a great review. Thanks Joy! Excellent article...much of what I thought. I really eat far less carbs than they recommend and I do not do dairy except yogurt....I just cannot. I think we must all look at our individual situation and use any of hele publications as a guideline but not a bible. Fabulously well done Joy! 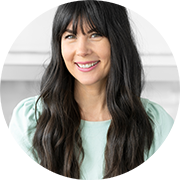 I have to say that until you wrote this article I didn't even look at the new Canadian food guide because my Julie Lehoux diet has been based off your pyramid for the last couple of years and it's now my way of life! Love how your analyse is made and easy to understand for everyone. Check out the scientific studies of Dr. Greger, Esselstyn and Campbell. I'm leaning towards whole fats, not processed. Thanks! It just muddies things for some people and I recommend to listen to your own body. It may not be 100% accurate for everyone (the serving recos) and you make it suit your own needs.